This month Brandemix took a look at Facebook’s recruiting on (of course) Facebook to learn from its efforts. 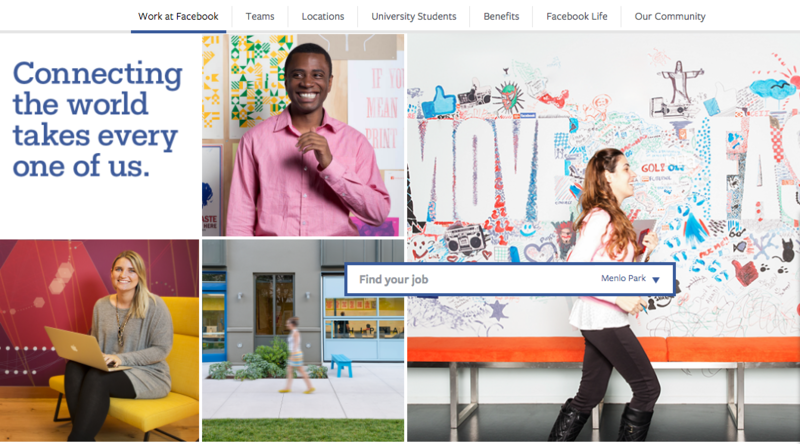 More traditional than one might expect, its career site, which also links to a more traditional Facebook recruiting page, checks all the boxes for a great example of how employer branding can shape a candidate’s experience of your company. According to most reports I’ve read on millennials, they want to work for purpose-driven organizations. While no one would accuse Facebook of being a not-for-profit organization, it has done a great job of creating emotional buy-in for its career opportunities by connecting to a higher and human purpose. It leads off with a few sentences that show it values people and humanity. Through short, engaging videos (and rollovers that further help segment the content) visitors can quickly learn about different paths, internships, accolades, and awards. Moreover, though the storytellers are different, the videos all share the same theme of doing meaningful work and connecting through people. Judging from the photos, Facebook employees are a diverse bunch of happy people working all around the world. In fact, every page offers the opportunity to connect to a team, a location, or a specific population (university, interns, managers etc.). The pictures themselves are stylized, diverse, and very engaging without being overdone. What I really enjoyed was the excellent copywriting throughout the site, as evidenced by something so innocuous as presenting the employee benefits in a people-focused way. Rather than an informative bulleted list, readers get the sense that HR tirelessly eliminating distractions and thinking of ways it can truly be of help to employees and their families. By focusing on seven key areas below, we’re able to connect you and your loved ones with the support you need. We’re committed to building a healthy community — one person at a time. We strive to be a great place to work for people with families. As we build a more connected world, it’s important that we stay connected to each other. We want to make your workspace as convenient as possible so you can focus on connecting the world. Sometimes you’ll need time away from work to be with family, attend to a medical condition, take a dream vacation, or just recharge. We’ve got you covered. All in all, it has done a fantastic job of interweaving the rational (compensation, development, challenge) and emotional (taken care of, purposeful, happiness) drivers of employment to eliminate the uncertainty of career change. And that’s at the heart of making a good impression through great employer branding. Want to know more?